Karoline Unger-Sabatier was one of the most famous singers of the age, a mezzo-soprano who sang in the first performance of Beethoven’s ninth symphony and whom Schubert coached in the role of Dorabella (Così fan tutte) during the short time he worked as a répétiteur at the Kärntnertor Theatre in 1821. 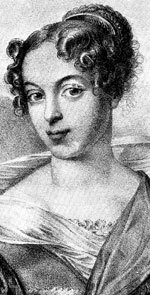 Karoline, a splendid interpreter of Schubert’s songs, was the daughter of Johann Karl Unger who was a Schubert enthusiast and patron, and also something of a composer. She left Vienna in 1825—her father missed her terribly—and returned to the city only for the 1839–1840 season when she was once again engaged by the Kärntnertor Theatre. Karoline Unger retired from the stage in 1843 when she married the French scholar François Sabatier. Her book of songs in autograph, prefaced by a dedicatory poem by Franz Schober in his own hand, contains a number of French romances, but also lieder in her native language. Her career as a composer, such as it was, dates from the years of her marriage and her residence in France.